Intel has changed the game in the Mini PC category. With a wicked new look and redesigned chassis, the Intel NUC unleashes maximum performance for PC gaming, content creation, and workstations. Be unstoppable. The redesigned Intel NUC Kit NUC6i7KYK with 6th generation Intel Core i7 processor and Intel Iris Pro Graphics unleashes maximised performance for intense game play, digital movies, music, and editing, and heavy workloads like analytics. 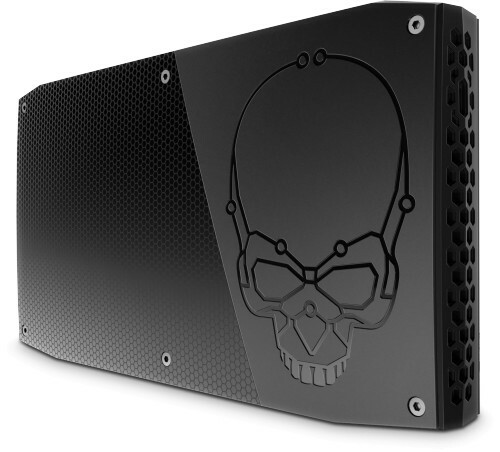 Intel created a new look, along with a new chassis design that lets you take full advantage of every GHz of the quad-core processor without overheating - making the NUC6i7KYK totally cool. Literally. Striking visuals in high resolution, fast frame rates, and Ultra HD 4K multimedia experiences. With a 6th generation Intel Core processor inside, you can watch, play, game, and create like never before. Experience visual perfection with Intel Iris Pro graphics. Watch captivating 4k video, edit photos and videos like a professional, and immerse yourself in vividly rendered, seamless 3D gameplay. When you use Intel Iris Pro graphics, you’re working smarter, playing harder and seeing the whole world in high resolution knowing you are using the best Intel Core processors. Powering the best processor graphics with enhanced media conversion and fast frame that delivers picture perfect performance, every time. With Thunderbolt 3 technology, you get multiple 4K displays, ramp your graphics performance with external graphics cards, or transfer your data to and from your external drive at an incredible 40 Gbps. The redesigned Intel NUC with 6th generation Intel Core i7 processor and Intel Iris Pro Graphics gives you 30x better 3D graphics for higher resolution and faster frame rates for powerful gameplay. Change the game. From editing images to rendering video, the 6th generation Intel Core i7 processor with Intel Iris Pro Graphics, gives you maximum performance for anything you create. Change the content creation game. Heavy Workloads and Nonstop Deadlines? No Problem. With a quad-core 6th generation Intel Core i7 processor, the Intel NUC gives you the performance you need to handle deep analytics and complex visualisations. Change your workstation. 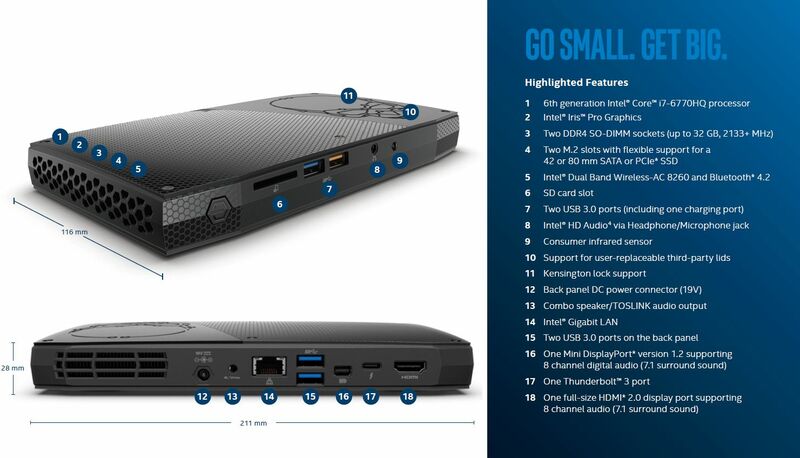 Intel have not published the noise levels of the i7 NUC so we thought that we would mention them. 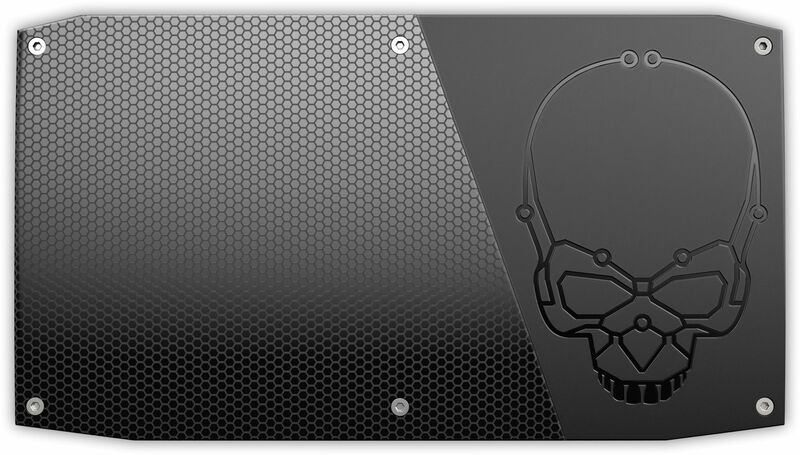 The i7 NUC is supplied with one small fan that is used to cool the CPU. At idle the fan noise is just about noticeable in a very quiet room. The noise becomes more noticeable as the temperature of the CPU increases. Therefore we recommend either the i3 or i5 NUC if you are looking for the quietest option although if performance is more important then the i7 will fit the bill. Storage options 2x M.2 SSD available separately.